Panasonic’s futuristic new gizmo may make airport employees’ lives a lot easier. 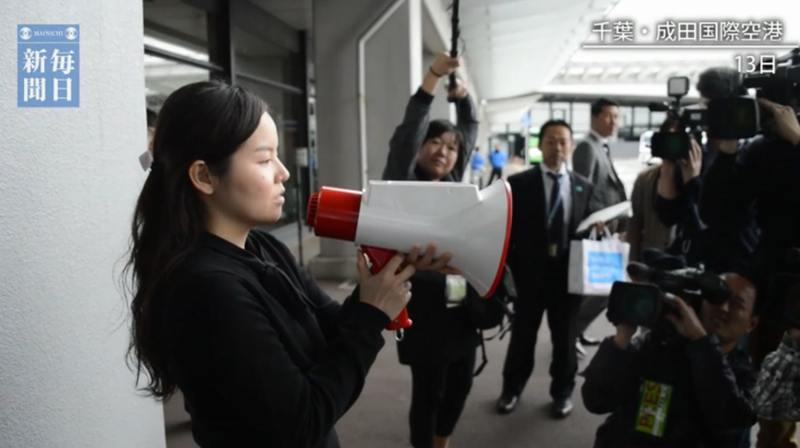 It’s called the “Megahonyaku” (a portmanteau of “megaphone” and “translation” in Japanese), and it automatically spits out Japanese sentences into English, Chinese, or Korean. Its real use, though, comes in times of disaster, Mainichi Shimbun reports: It would also have come in handy in Japan last year during those rare, heavy blizzards last year, when Narita airpoert staff apparently had difficulty communicating to stranded tourists information about sleeping bags and water. Watch a video of the Megahonyaku in action here. It’s still unclear how extensive the device’s capabilities actually are, but that’s something that Narita officials will learn during this period of testing. (Mainichi says that the translation powers are on par with a smartphone app.) Japanese airports are no strangers to experimenting with emerging tech; earlier this year, Haneda International, Tokyo’s other main airport, announced that it’s adding helpful robots to its staff, assisting customers in carrying heavy bags and giving them information. We also previously reported on Panasonic’s plans to get instant translation devices that are handheld to consumers. It’s part of the company’s goal to help ready Tokyo for the influx of foreigners for the Asian city’s Summer Olympics in 2020. Top image via Mainichi Shimbun, bottom image via Narita Airport.